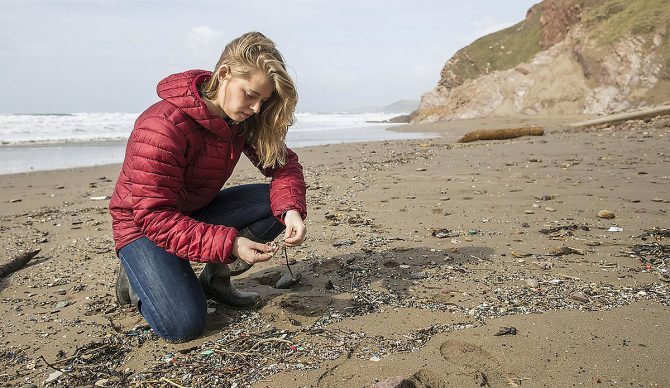 Imogen Napper is a marine scientist from the South West of England who is dedicating her life to getting to the bottom of our ocean’s plastic problem. Like many of us who have fallen in love with the ocean, it was a passion for surfing that first drew Imogen to the beach and opened her eyes to the realities of marine pollution. Now, just two months away from completing her Ph.D., investigating the sources and fate of plastic in the marine environment, Imogen is fired up to make a difference in the world. She’s especially interested in the ways in which the ocean becomes polluted that we often overlook. Last year, the UK saw a ban on products containing microbeads. It was catalyzed by Imogen’s research—carried out with the help of others—at the University of Plymouth and since then, she’s decided to continue her research there under the guidance of Professor Richard Thompson. More recently, Imogen helped shine a light on the significant levels of microplastic reaching the ocean when we wash our clothing. The 12-month long study found a single load of clothes could release up to 700,000 microplastic fibers. This study supported earlier work carried out by the University of California Santa Barbara, in partnership with Patagonia, which found that each wash of a synthetic fleece jacket released an average of 1.7g of microplastic fibers. So far, Imogen’s most shocking encounter with marine plastic has hit surprisingly close to home. After a series of memorable storms battered the UK’s southern coastline last winter, the beaches were awash with plastic. “I thought it must be fake,” she recalls when describing the strand line at her favorite local beach, Whitsand Bay. “Locals didn’t know what to do. Even if you tried to remove buckets-full of plastic, you hadn’t made a dent in the problem.” It’s sights like these that capture attention and are helping Imogen to stay motivated on tough days. Sometimes, the sobering realities of just how big our marine plastics problem is can feel overwhelming. With the recent news of a deposit return system in the UK and the 5p plastic bag levy providing a sustainable way of changing consumer behavior, there is a lot to be hopeful for. “Consumers, industry, and policymakers working together — that’s when we’ll start to see real change,” Imogen asserts. “Consumers must take ownership of what they’re buying, what they’re using, and what they’re throwing away.” Having a “no plastic-mindset” and refusing single-use plastic in any form is a good starting point for the individual. On an industry level, manufacturers must take more ownership of their products from cradle to grave. A circular economy, Imogen agrees, is the dream scenario. Whether we realize it or not, her passion and persistence for science are benefitting not only our oceans but all of us, too.